Ten’s new primetime game show Family Feud grabbed 690,000 viewers across the network’s three channels on its return last night. That number is 381,000 viewers up on the showing of Modern Family on Channel Ten’s main channel last Monday in the 6pm timeslot, with the network hoping the heavily promoted revived format, hosted by Grant Denyer, can draw more viewers to its primetime lineup. However, at this stage it is unclear how Ten’s strategy of road blocking Family Feud across not only its main channel but also Eleven and One has affected the audience with Oztam folding in the results for all three networks together citing the programming and adverts being the same during the broadcast and not providing a channel by channel breakdown. It was up against Seven News and Nine News on the main channels which got 1.2m and 1.32m respectively. The Voice came in second place for the night with an audience of 1.24m whilst Seven’s The X Factor was beaten by Ten’s Masterchef’s with the cooking show getting an audience of 1.04m compared with 970,000 for the talent show. The result for Seven’s X Factor is the lowest ever rating episode for the talent show which down 21 per cent since its launch on Sunday. 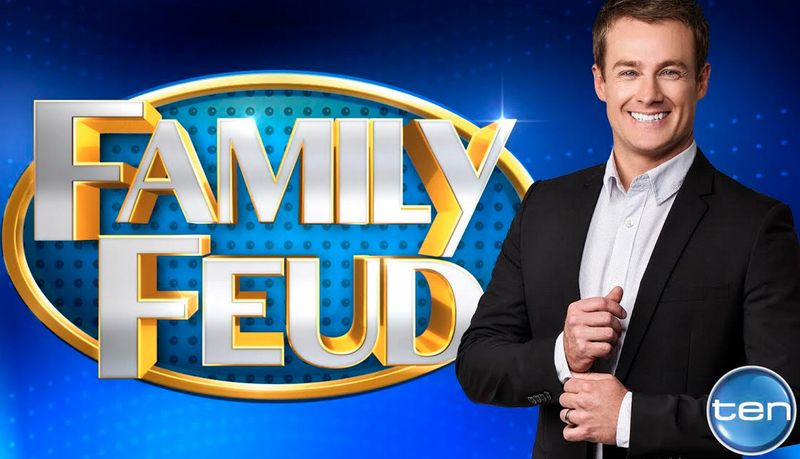 Overall Family Feud’s result helped the Ten network boost its main channel audience share by 0.8 percentage points with the network showing 13.1 per cent up from 12.3 per cent last week. “We are very pleased with the first-night ratings for Family Feud. It is a good start. We are happy with the show, happy with Grant and happy that many Australians enjoyed the show,” said Beverley McGarvey, chief programming officer Ten. On the other channels Nine topped the night with an audience share of 24.6 per cent down 0.1 per cent, Seven had 18.1 per cent up 0.3 per cent. On SBS the final of the FIFA World Cup match between Germany and Argentina drew 883,000 for the early morning match which kicked off at 5am. What was TEN’s total audience across all three channels at 6pm in recent times? That will give you a clue as to how FF really went. How are these figures calculated? If they are based on a load of commercial influenced TV guinea pigs, then how can they be taken seriously? Although things are moving to digital the ratings are based on a panel of people with smart boxes inputting what they are watching, and how many people are in the room. The 833,000 is an estimate of PEOPLE who watched the World Cup. The 833,000 represents the average minute of the broadcast. So those who only managed to wake up and watch the second half, effectively only count as “half a person”. It’s very different to the digital world which tends to count DEVICES rather than people, and often focuses too much on watching ‘any’ (e.g. a few seconds) of video content. New ‘hybrid’ methods use census-based traffic data and people-based panel data to provide more comparable audience estimates. Yes that’s all well and good, but using the old ruler and compasses, it rated better than expected and will I believe grow. The next few weeks will tell, it needs to work miracles, but it might be the answer. It had better work miracles or it stands a good chance of either flying super high by its own devices, or being shot down by its own guns. This kind of programming is one of the few ways back for ten, but they must work at it diligently.